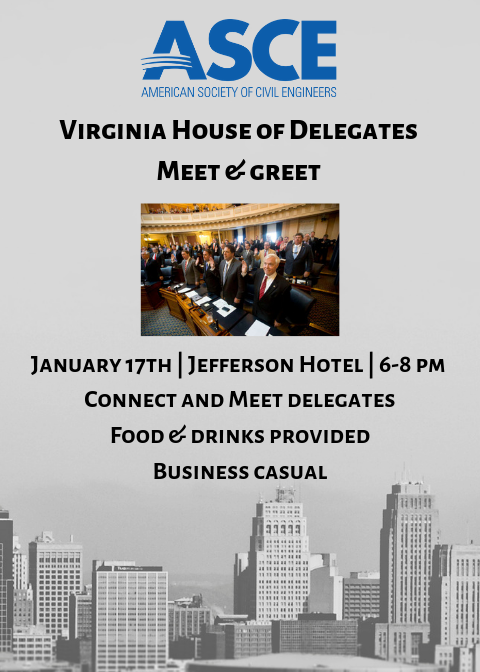 On Thursday January 17th from 6-8 pm, ASCE will host the Virginia House of Delegates Meet and Greet in the Empire Ballroom at the Jefferson Hotel downtown Richmond. The Virginia House of Delegates consists of 100 members that are responsible for passing bills on public policy matters, setting levels for state spending, raising and lowering taxes, and voting to uphold or override gubernatorial vetoes. This banquet meet and greet will be an opportunity to connect and meet with our House Delegates over food and drinks. Dress code: Business Causal.